The LAMBDA DOSER & HI-DOSER powder feeder is a unique programmable powder pump for free-flowing solid substances. It allows automated continuous dispensing or intermittent addition (with pauses) of powders, powdery and crystalline substances without a spoon. The powder dispensers with an optional foot-switch can be used to dispense the powder in portions in media preparation, monitoring and screening. The powder dispenser consists of a dosing unit coupled to a digitally controlled stepping motor, allowing the constant and reproducible dosing of solids. As the DOSER / HI-DOSER powder feeder offers different control options, it can also be used in automatically controlled processes. Automation of the powder dispensing process in the life sciences, pharmaceutical or analytical laboratory can be done with the programmable powder dosing pump as it reduces human error, risk of spillage and conforms to laboratory safety standards. The powder dosing instruments such as DOSER 0.2 L, DOSER 1 L, DOSER 3 L, HI-DOSER 1 L, HI-DOSER 3 L and its accessories & consumables can be viewed at www.lambda-instruments.com/powder-doser/doser-hidoser-image-gallery/. 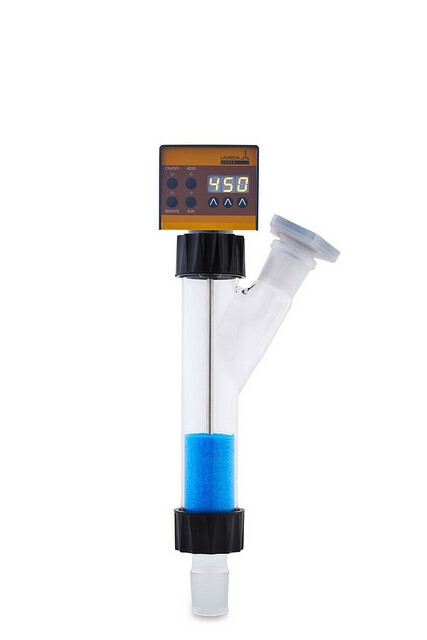 The dosing speed can be set directly on the control display of the powder feeder or remotely from 0–999 speed range for precise and reproducible solid flow rate. The powder dosing rate depends mainly on the powder properties. *On the HI-DOSER unit, you can work with either slow or fast mode at a time, based on your flow rate requirement. Dosing speeds and dosing times with pauses can be easily programmed locally on the pump display. The entered program can be repeated 'n' number of times (1-99 or infinite loop) with the “cycle” setting in the program. Corresponds to 250 g NaCl, 200 g NaHCO3 or 150 g sucrose. This capacity is optimal for most laboratory applications. The glass vessels are interchangeable. 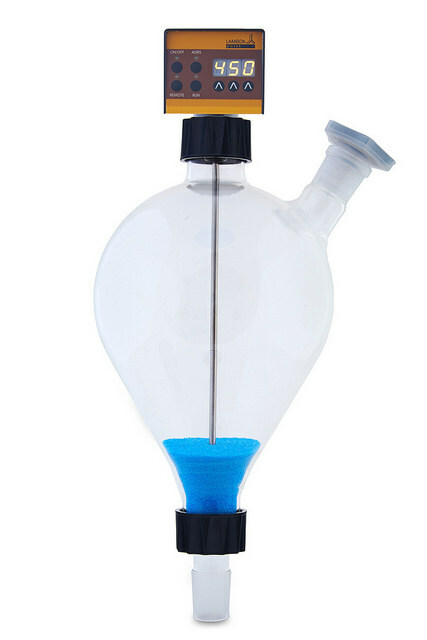 For larger volumes, the side neck in the glass vessel allows filling during operation. The whole speed range of powder dispensing can be remotely controlled by applying a voltage of 0-10V. Switching the powder feeder on and off (ON/OFF) is controlled by an external contact or 12V signal. The RS-485 or RS-232 interface (optional) allows for enhanced PC control (variable flow rates, flow profile, etc.). A PC control software PNet is also available (optional). Please refer the LAMBDA DOSER / HI-DOSER User Manual for connection details. The PNet PC control software is ideal for remote control of dosing units, data storage and visualization of powder dosing. You can connect up to 6 powder dispensers via RS-485 interface and cables to USB or serial port of the computer, without having to purchase additional software licenses for the additional laboratory equipment. The PNet software allows to create dosing profile, record data for analysis or comparison, visualize real time trends and to save data to PC. 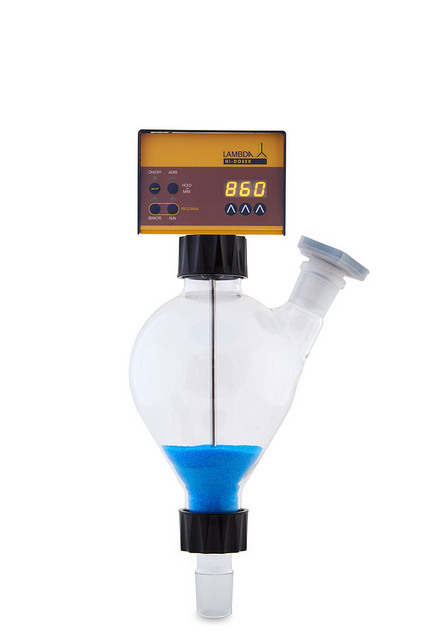 The powder dispensers LAMBDA DOSER and LAMBDA HI-DOSER allows a safe and reproducible dosing of hazardous chemicals in the lab and conforms to modern safety rules. To protect the laboratory technician or researcher or student, the powder dosing device can also be controlled remotely. The hermetic construction of the DOSER and HI-DOSER allows safe handling of dangerous and toxic solid substances. 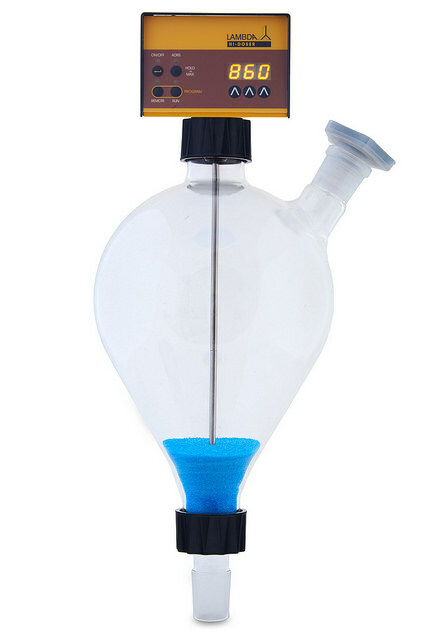 Several seals make the DOSER air-tight and it can be used with a slight over- or under-pressure. 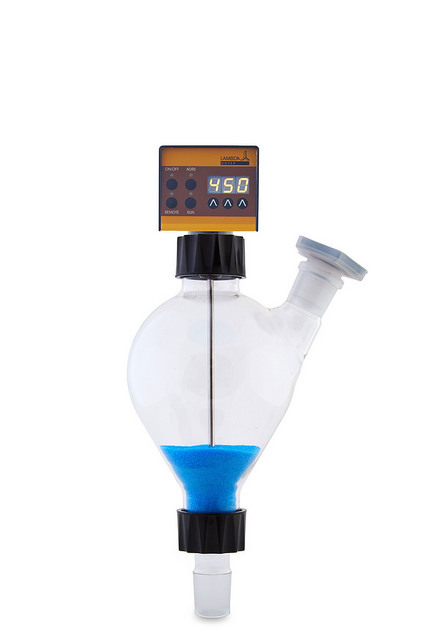 If the powder sample has to be protected from agglomeration or reaction with air humidity, the glass vessel can be purged with inert gas or dry air using the supplied gassing plug. If the process needs to be protected from the risk of breakage, you can also order the glass vessels with a silicone coating (outside). All parts in contact with the powdery substances are made of chemically resistant materials. LAMBDA DOSER / HI-DOSER powder feeders are recommended for high quality standard of powder dosing in the laboratory. In addition to the digital setting and precise dosing mechanism, the automatic recording of dosing data makes it an optimal choice to dispense powders under GMP and GLP. The lab powder dispensers DOSER and HI-DOSER has been designed specially for easy assembly and cleaning. The DOSER and HI-DOSER can be coupled to all common glass recipients having standard ground fittings NS 29/32 or SVL threaded connectors. It can also be fitted to the reactor vessel using an adaptor. Special attention has been paid to minimizing the dimensions of all parts of the powder dispenser. Thus, DOSER 0.2 L can be adapted easily to complex laboratory installations. The robust construction and the use of high quality materials assure a long lifetime of the powder feeders. Automated dispensing of powder portions in the lab gives the time for the lab staff to work on other tasks. Due to better reproducibility and elimination of errors, the number of experiments can be reduced. The DOSER and HI-DOSER offers an excellent price-performance ratio. The powder DOSER can be configured with the electronic LAMBDA INTEGRATOR (optional) and allows the quantification of the amount of powder added as a function of time. This provides important information on the processes or reactions, e.g. when the DOSER is controlled by a controller (pH-stat, thermostat, etc. ).